Welcome to AdriannaBohrer.com, a style + lifestyle blog. I’m so happy you’re here. I hope you find something to inspire your style + simplify your mom life + encourage you to live a little healthier! I’ve cut my hair short twice in my twenty-some years of life with very different end results. 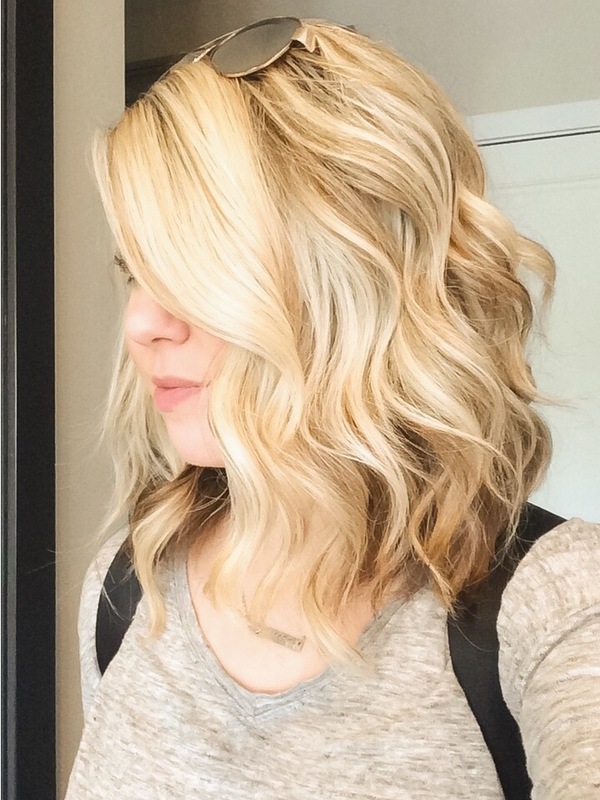 First time, I chopped it into a short blonde bob + absolutely loved it! It was the best hair decision I had ever made. Second time, I chopped it into a chic lob + cried for two days straight and starting growing it out right away. Since I loved my short hair so much the first time I cut it, I just assumed I would love it again... boy, was I wrong. So what was the difference? That’s a great question! 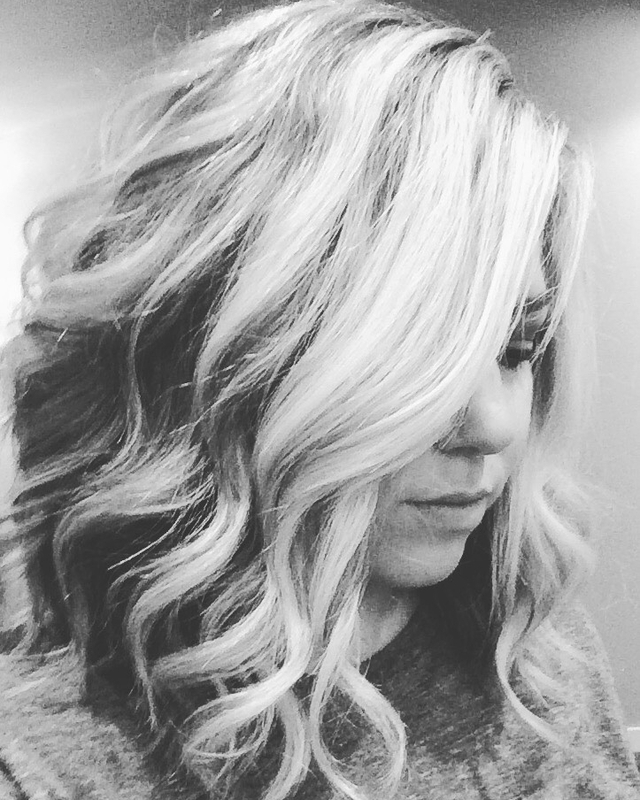 And here’s my answer in the form of 5 Questions to Ask Yourself Before You Chop Your Hair.... If you’re caught in the middle of this super exhilarating yet super exhausting haircut debate, I hope this helps you decide + then own that decision with confidence! #1 Why do I want to cut my hair? FIRST TIME: Be brutally honest with yourself, here. The first time I cut my hair, I needed a change from the unhealthy split ends + forever-medium length hair I just couldn’t get to grow for various health reasons at the time. So if you’re in the same boat and just want to chop it off to let it grow back healthier, I say go for it. You may even find you want to keep the shorter hair for a while. SECOND TIME: The second time I cut my hair, I was 3 months postpartum and so sick of wasting all my time washing, drying, combing, and styling my long hair. I told myself (and everyone else) I was cutting it so I could save time getting ready and spend that extra time with my son. (I remember Carrie Underwood saying something similar when she cut her long locks into that gorgeous blonde bob a couple years ago.) But truth be told, I was actually cutting my hair to make me feel like a better mom, because I thought it was so selfish to take so much time doing my hair. Silly, I know. But mom guilt is real + so are postpartum hormones! MY ADVICE: If you’re in the middle of a major life change (especially a hormone-fueled one like having a baby), my advice is it wait it out a couple months and settle into your new normal first. Then see if you still want to cut your hair a few months later. In the meantime, you could just cut a few inches off to lighten it up or have fun with topknots, messy buns, and baseball hats for easy on-the-go style! STYLE TIP: It’s so tempting to want to make a major hair change when you’re going through a major life change, but it’s important to remember that cutting your hair won’t change who you are. It won’t change your life or make it any easier to settle into any new changes around you. Bottom line: a changed woman might cut her hair, but cutting her hair doesn’t change a woman. #2 How much of a hair length change is it? FIRST TIME: This is a super important question, and one I ever even thought of my second time around. The first time I cut my hair into a cute blonde bob, my hair was barely past my shoulders and so cutting off a few inches wasn’t so dramatic. It actually felt quite refreshing! SECOND TIME: The second time I chopped my blonde locks, my hair was the longest it had ever been and down to my mid-back, so chopping it all off at once was a very drastic change (cue: the tears). MY ADVICE: If it’s more than a 3-5 inch change, go in stages. I know it’s super tempting to want that drastic before and after photo, but it’ll be a lot easier to grow out a few inches at a time if you happen to change your mind in the process! Keep in mind your hair grows about 6 inches per year. #3 Will having short hair actually save me time? FIRST TIME: This question may not apply to you, but one of the most common reasons people have for cutting their hair is to save time getting ready. Short hair takes less time to wash + dry, but it looks greasier faster and needs to be washed more often. The first time I cut my hair I was in college and my main reason for cutting it wasn’t necessarily to save time, so this wasn’t a big deal. SECOND TIME: Short hair may take less time to style but it needs to be styled at least a little everyday (5 min messy buns and topknots don’t work as well anymore), so the second time I cut my hair this came as a shock. I was experienced in styling short hair but I still struggled with losing my quick + easy messy bun, topknot, and ponytail hairstyles. MY ADVICE: If you don’t have a consistent 20 minutes to style your hair every morning, then this style may not be right for you right now. #4 Do I know how to style short hair? Or am I excited to learn? FIRST TIME: The first time I cut my hair, I had no idea how to style short hair but I was super excited to learn. I had lots of fun watching YouTube tutorials and experimenting with different curling and flat iron methods of styling. SECOND TIME: The second time I cut my hair, it was 4 years later and I surprisingly struggled with learning new ways of styling it. The haircut was a slightly different length then the fist time and I found it super frustrating to have to learn new ways to style it, especially since my main reason for cutting it was to save time. MY ADVICE: If you’ve never had short hair before, it may take a few weeks of extra attention to learn how to style your new haircut. This isn’t reason enough not to cut your hair short, just something good to note for when you do! #5 How long have I been talking about cutting my hair? FIRST TIME: The first time I cut my hair, I had been talking about cutting it for years + spent hours googling Chelsea Kane’s iconic blonde bob for inspiration, so it was really fun to finally go for it! SECOND TIME: The second time, I definitely rushed into cutting my hair assuming I would love it as much as I did the first time without actually thinking it through or going in stages (like I suggested in Question #2). If you get a spur of the moment urge to chop all your hair off on the way to the salon, you may want to ask yourself Questions 1-4 first! MY ADVICE: If you’ve been talking about cutting your hair for years, then girl, what are you waiting for? Either go for it OR let it go + start enjoying the haircut you already have! It exhausting to live in that should-I-shouldn’t-I phase for forever, so be confident in your decision and stick with it! If you’re in the middle of that never-ending, keeps-you-up-at-night, should-I-or-shouldn’t-I chop all my hair off debate with yourself (+ your girlfriends + your mom + your husband + anyone else who will listen), I hope these 5 questions help you decide whether or not to take the plunge! It’s super exciting to make a major hair change (or finally decide not to), and I would love to see + hear if this article inspired you! Leave a comment below + let me know! Thanks for reading + following along! It means so much to have you here! Stuck in a style rut? … Feeling bored & basic in your everyday outfits… Want to mix it up in your mom style? Download this checklist & make sure you have all 7 pieces you need hanging in your closet to be able to create those effortless mom style outfits! Don’t forget you can pin these photos to Pinterest + save them for later! Keep them on your Style Board for outfit inspo you can come back to again and again… Use the Pinterest button below or simply click on any photo to save it. Oct 7 Virtual Book Club: All the Details!